Adair: I’m sitting here with Matt Stocker, Director of the Stocker Partnership. Welcome to the studio, Matt. Adair: Ah well, it is a pleasure to have you here. Now, I invited you on because you are one of the business gurus of our city, and in fact, you run your own consultancy—that’s right? Adair: So, I was thinking to myself, how do you go—or why, even, would you go—from a nice, stable job to starting up your own business? Isn’t that a risky thing to do? Matt: Um, yes. Probably—especially at the beginning of a rather large recession, which you might have noticed over the last few years. Adair: It has crossed my attention, yeah! Matt: I mean, ultimately, I set the business up to create myself the job that I wanted but couldn’t find. So, it was really to create myself the ideal job. Adair: Well, that sounds like a pretty good reason. And how do you go about that? Do you just quit your job and start as a trapeze artist, or whatever you enjoy doing? Matt: I guess I was in the fortunate position of being able to take voluntary redundancy, so that obviously gives you a bit of a kick. And it was either taking voluntary redundancy or waiting until the actual redundancy happened. So I decided to go for the voluntary option and, I guess, make my move while I could. Adair: Well, that sounds pretty good. And how’s it gone so far? Matt: Yeah, it’s been good. It’s had its highs and lows. Adair: So what are the good points? Why would you commend it to us—starting a business? Matt: I think…It’s yours! You’re not relying on anybody else—that can be a good thing and a bad thing. But I think that you’re creating something that you’re creating, rather than having somebody else telling you what to do or just working for your pay packet, actually you’re building something. And I think that’s really satisfying. And I guess the kind of work that Debbie and I are doing, it would be very hard to find this kind of work unless I was working for a different consultancy. But then I thought, well, I might as well start my own consultancy rather than working to build somebody else’s consultancy. Adair: And naming it after yourself, as well. Adair: Why not? And you mentioned Debbie—so who’s Debbie? Matt: Debbie is my wife and business partner. Adair: Ooh. Wife and business partner—that’s brave! Matt: Wife first and then she joined the business about two years after I started it. Adair: Ok. And does she work for you, or do you work for her? Adair: You’re such a diplomat! Now, I must say, I love my wife incredibly, she’s an amazing woman but I’m not sure that she would ever want to work with me, no matter though I’d want to work with her. How does that work? Do you work from home together? How do you switch that relationship round? Matt: Yeah, so we work from home. We did add an office dog into the mix, who is in charge of distraction and getting us out of the house when we’re working too hard. We work very well together. I have 51% of the shareholding and Debbie has 49%—the 2% is due to me starting the business and our accountant said, “If you ever do disagree, one of you needs to have the majority.” But fortunately, it hasn’t worked like that, so we haven’t needed that, “I have more shares than you,” argument. Adair: [laughs] I’m glad. And how do you go about…because presumably you don’t work 9 to 5? Adair: Do you set your own holidays? Do you holiday 12 weeks a year? How does it go? Matt: We haven’t quite reached that stage yet! We keep it flexible. So earlier this year, we had got a holiday planned but we just had too much work on and client deadlines, so we postponed that. But then, when you’re in a quieter patch, you can go, “Well, how about a week off?” The boss agrees. Or both bosses agree. So you go for it and just take the week off. Adair: Very nice indeed. And there must be some downsides to it—because you paint a beautiful picture of being at home with your wife and your dog making shed loads of money doing your perfect job. Is that how it really is? Matt: Um…in a good week, yes. I think there’s…you do trade some of the security, so I guess if you’re used to working in employment it’s quite a big difference in that you have a very specific role, you have a defined salary and you have a defined job role. So you do the job, you get paid, and you know when the payment’s going to hit your bank account. Whereas running your own business, actually there’s a lot more uncertainty. So you have to invoice your clients; you then have to get paid; you have to pay all of your tax and PAYE, and all of that kind of stuff; and then you get paid—essentially last. Adair: Speaking about pay, one of the things in the Queen’s speech this year was some new legislation to try and help small businesses to get paid, because apparently they get paid late a lot. Is that something that you’ve experienced—as having issues with payments? 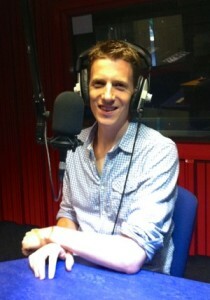 Matt: Earlier on in the business, yes. But we’ve made various changes in terms of credit control. And also the types of clients that we work with has meant that that hasn’t really been an issue over the last couple of years. But it’s certainly something that businesses struggle with. Some of the research out there suggests that actually…some companies will actually wait a couple of weeks before they invoice, whereas the research shows that the quicker you invoice after you’ve done the work, then the quicker the company will actually pay you. Whereas if you leave it longer, then the company paying you will also leave it longer. Adair: Wow. Fascinating stuff. Good tip there. Thank you, Matt Stocker. We’ll be back with Matt after the business news. Adair: You’re back with me, Adair Richards, and we’ve been speaking to Matt Stocker from the Stocker Partnership, who is an entrepreneur and consultant. Now, a consultant may mean many things. If you’re a doctor, it means you’re, like, top of the tree. Now, my understanding of a business consultant is basically—you go into a business and you decide to tell people to fire everyone and then the Managing Director doesn’t get the stick from his employees. Matt, is that correct? Matt: I think that would probably be a very cynical and jaded view of consultants. I think it does happen. Sometimes MDs kinda need the confidence or they’re looking for somebody to blame. But I think, in the vast majority of cases, your work is a lot more positive than firing everybody because that’s generally not always the case for how you create business value! Adair: Good. It was a little bit of a facetious question! Adair: So what do you do then exactly? Adair: So you say the words, but my head just goes, “Blah,” which is like when I try to explain science to people! Matt: Yes. So there’s strategy, which is how businesses get to where they want to get to. And then there’s innovation, which is really, “How are you going to do things that are different?” “How are you going to set yourself apart from competitors?” So, ultimately, you as consumer, you choose the better product, you choose the better service. And, as a business, how do you make sure that you’re the one chosen rather than the one left on the shelf? Adair: Ok. So do you go in and speak to everyone and tell them the answer? Or how does that work? Matt: It really depends on the project. And I guess that’s part of what we love about our jobs, really, is that no two projects are the same. So sometimes it will be very facilitatory, sometimes it will be quite a lot of market research, sometimes it will be training. It really depends on either the problem or the challenge, or the outcome that the business wants. Adair: Well, let me give you a problem then and see if you can help out, not just me, but the entire nation. Let’s say that we brought in here Roy Hodgson and the whole England football team, who, let’s be fair, have not exactly done amazingly well over the last couple of weeks. And our project is to make the England football team half decent. How would you go about that kind of process? Adair: Wow. So an All Star team is quite hard to bring together then? Matt: I think so. I guess that’s what everybody else does though, so what our secret is, I have no idea. Adair: Perhaps we should just, kind of, give it up and take German nationality, then at least we’d be half decent, hey? Or maybe not. Ok, well lets move it on to perhaps something that you’re a bit more familiar with, and that’s the business environment here in Coventry and Warwickshire. Are we really out of recession? Have you noticed things change the last year or so? Or, in fact, are we still in the doldrums? Matt: I think, generally, things are looking much more positive. I think a lot of the thing about recession is about people’s confidence levels, and I think people have stopped complaining. And I think that, generally, people are feeling much more positive that we are through the worst and that we can be much more positive. I think that the recession has changed people’s attitude somewhat. I think people are probably slightly more risk averse—the memory of pain is still etched into their memory—so I think people will move forwards with maybe more caution. But I think there’s opportunity there for the businesses that want to move forwards and innovate, whilst their competitors are maybe just still storing money under the pillow or under the mattress. Adair: Sure. So, some of our listeners will be either not in a job yet or at the moment, or thinking about maybe a change, and they may be thinking about becoming an entrepreneur. Now, as someone who’s done it for a few years, and yet is still so youthful yourself, do you have any advice for them? What would you say if they’re considering a career as an entrepreneur? Matt: Yeah, I think most of it’s about going for it and actually making the decision. It’s not necessarily that you have to do it straight away but making the decision that that’s something that you want to work towards. So whether that’s going and getting the skills that you need in order to actually run your own business. Whether that’s going off and doing market research in order to find out whether there’s legs to your business idea. Maybe saving, so you’ve got a bit saved for a rainy day, so if things don’t quite go to plan in the early days then you’re not suddenly stuck without any cash. I think that there’s lots of things that you can be doing even if you’re not immediately ready to actually set your business up and resign from your job. Adair: Great. And if anyone wants to find out more about you, and your work, how would they get in touch with you? Matt: Probably our website’s the best thing. So, that’s www.stockerpartnership.com. And that’s ‘S-T-O-C-K-E-R’ and then ‘Partnership’ (hopefully you can work out how to spell that). Adair: Yeah, if you can’t spell that, then you’re not interested! Adair: All right. Matt Stocker, from the Stocker Partnership, thank you so much for joining us tonight.